The primary filming location was Mount Suilven in the Northern Scottish Highlands near Lochinver. Edith Moore (Edie) is a bitter, gruff woman in her eighties. In the months following her husband George’s death, Edie’s strained relationship with her daughter Nancy begins to worsen. The question over Edie’s future looms large; while Edie tries hard to convince Nancy she can manage fine by herself, Nancy is making plans for her mother to move to a retirement home. Edie feels like it is the beginning of the end. It seems she will die with all the regrets of her past intact and one regret haunts her most of all. 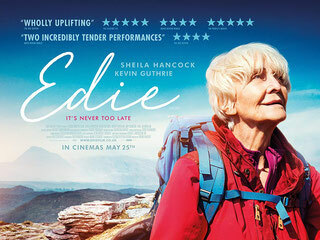 When Edie was married, her father planned a climbing trip for them in the Scottish Highlands. Edie wants to go, but her husband George, a difficult and controlling man, made her stay at home, nearly thirty years later, Edie decides to make the trip herself alone. Of course you can walk to the top of the mountain yourself, Suilven may be only 731 metres high, but because of its remarkable shape (very easy to identify), it is one of Scotland's best known mountains. Its position in the heart of Assynt and superb views make it one of the finest peaks in Britain, but be aware that the climb to the ridge is very steep.